A sports magazine from 1940. 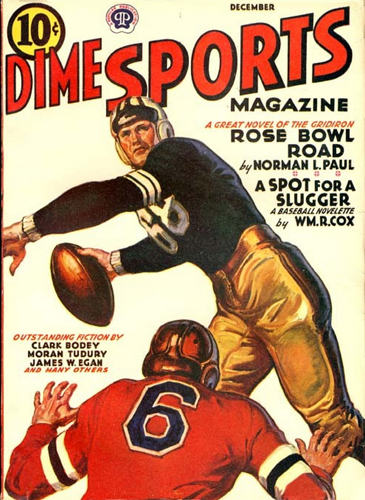 The 1930s and 1940s were the heyday of sports magazines and comics. As college football grew in popularity during this era, stories featuring characters who played the sport abounded. And the Rose Bowl game was a common setting for the climax of the stories with titles such as "Rose Bowl Express," "Rose Bowl All-American," and "Rose Bowl Outcast." At least one, a novelette by Arthur Grahame titled "Alabama" appearing in the Oct. 8, 1927 issue of Sport Story Magazine, featured a protagonist who played for the Crimson Tide in the New Years Day classic. Epp Sykes And The Composition of "Yea Alabama"